I clutched "Toy Castles and Knights" feeling uncertain it would be a read to hold my interest and fearing I would be filling a couple of hours with half my attention on the task. Was I ever wrong! "Toy Castles and Knights" held my imagination rapt for two hours passing ever so quickly that I was sorry when I turned the last page. Author Joseph Svec warns: "Buckle on your sword, take hold of your shield, grab your dragon repellant . . ." Yes, this is a fantastic quest, chronicling the inception of toy castles and knights; guiding the reader through Camelot, Sherwood Forest, the Land of Narnia, and Helms Deep; and taking us through Germany, France, Spain, Italy, Great Britain, Russia, and North America. Who wouldn't want to accompany Joseph on his passionate journey? Reading "Toy Castles and Knights" reminds me of the hours my brother used to play castles and knights with his friends and how I would hover over him, hoping he would invite me to join. When he was feeling magnanimous, he would let me play Guinevere or Maid Marianne. I was never bored, whether a participant or observer. ü The Lancelot Toy Castle has a moat that actually holds water. ü Trapezoid-shaped toy castles were produced in Spain and in Italy. ü The castle-building company, Exin, offered specialty pieces that included doorframes, barred windows, wall-mounted torches, brackets, sconces, shields, a drawbridge, a portcullis, tiled tower tops, staircases, and stained-glass windows. ü Some of the Playset box art is very rare. 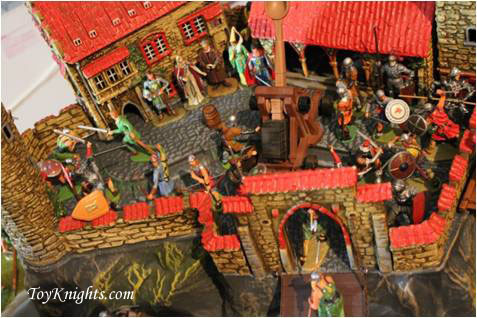 ü "'King Arthur and the Knights of the Round Table – Camelot Castle Playset' . . . has to be the longest playset title ever produced." ü "The Barzso Nottingham Castle is absolutely massive. It is the finest and most detailed 54mm castle (Joseph has) ever seen." Ah, but there must be kinsmen to people these castles in case of a siege, to joust in a tournament, or for sorcery's sake. Never fear, there are a plethora of knights -- Arthur, Lancelot, Galahad, Perceval, Templars -- or other figurines -- Robin Hood, Friar Tuck, Willow, Frodo Baggins, Merlin -- to interact with their adversaries -- Dragons, Orcs, Demons, Gargoyles, and Castle Ghosts. The knights and figurines will need armor, shields, battering rams, crossbows, winged horses, Viking ships, and banners. It's all there; described and photographed in Joseph Svec's thorough and entertaining book. It's a book that enchants me still; for since I have read "Toy Castles and Knights," my runaway mind has hosted a continuous-feed song from the classic quintessential castle-knight vehicle, the 1960 musical based on T. H. White's The Once and Future King: ". . . in short there's simply not, a more congenial spot, for happy-ever-afterings than here in Camelot." He will be happy to talk with you about his books and sign purchased copies. Over one hundred toy castles dating from the 1950's to 2011, from ten different countries, along with hundreds of toy knights, Crusaders, Vikings, and fantasy figures (not to mention Dragons) are photographed in full color and described in detail in this engaging guide book filled with beautifully detailed toy castle dioramas. Buy the Toy Castles and Knights book!